Beatrix on We’ve got news: we are now ISO certified! Aniko on Language of the Month – January is ITALIAN! Cinzia on Language of the Month – January is ITALIAN! 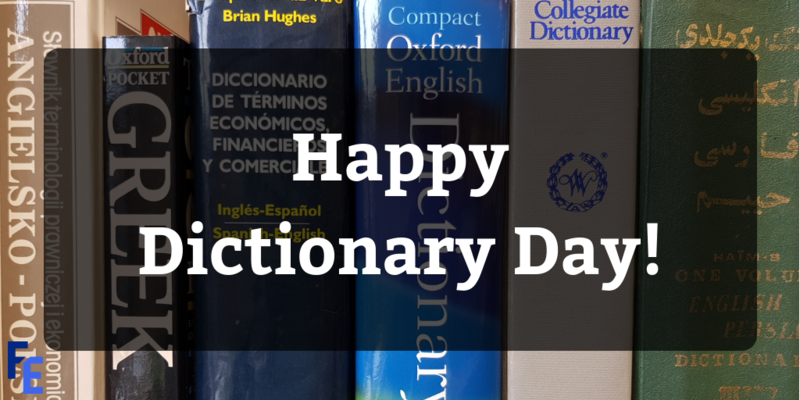 National Dictionary Day was held in the US yesterday to commemorate the great American lexicographer, Noah Webster’s birthday, who was born on 16 October 1758. We ended up discussing thesauruses and synonyms. Does the word “synonym” have a synonym? Does every word have a synonym? Or rather, does any word have a true synonym? Synonyms usually differ in some minute nuances in their meaning, right? Otherwise languages would be rather uneconomical. Having two words that mean the exact same thing?! That would be a waste of precious dictionary space! What do you think about the matter? Please share your thoughts, ideas, speculations! Get in touch via email (enquiries@firstedit.co.uk) or by giving us a call (01223 356 733)! Previous Previous post: Language of the Month – October is HUNGARIAN! Next Next post: Language of the Month – November is HINDI!